Looking for the best in fine art? You will find it here. 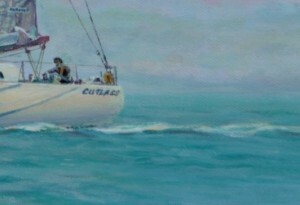 Here you are on the water with an American ‘Cutlass 40’ yacht in light airs. 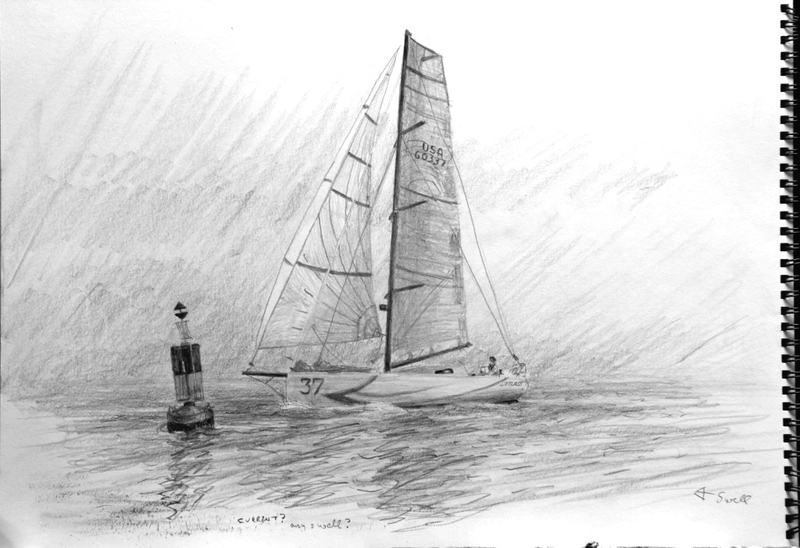 The Cutlass 40 is very modern very quick yacht, seen here about to win a major single handed race. 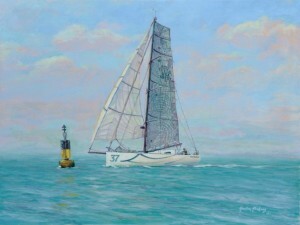 When we were discussing ideas for this painting, Gordon Frickers client particularly mentioned the remarkable “Roaring Forties”, 76 x 121 cms (30″ x 48″) painted for Sir Robin Knox-Johnston, now one of his most treasured possessions, Sir Robin has often chosen “Roaring Forties” as a background when being interviewed. Roaring Forties has inspired many people and been extensively published in journals as diverse as The Times of London, Lloyds List and Readers Digest. This time ideas we discussed included a day when the Cutlass 40 clocked 26 knots and that with a broken bow sprit too, “blasting down to Montego Bay on port gibe just off the shore of Cuba during the pineapple cup“and a night approach to Hawaii all very tempting subjects. However while those subjects are beautiful memories the Bermuda win was really something to be proud of. Some clients, Peter de Savery for example simply tell Gordon Frickers to ‘just get on with it‘ others like to be more involved. This time the next stage was to produce sketches that lead to a design the client approved. How much sail was up? What did the sails look like (cut, colours, any unusual features like logos etc)? Do any photos exist of this day, showing your boat or others in the fleet? How many people on deck? By the way the above drawing measuring approximately 20 x 40 cms (11″ x 16″) is available for sale price £200.00 Contact Us for details While Gordon Frickers understands and reacts well to ‘rush’, ‘vite’, ‘deadline’, having a client who allows time undoubtedly helps the painting. The finishing touches on this marine painting were added in steady thoughtful seaman like manner; simplified sky top right & made the swell look longer & smoother, rigging checked and any hesitant marks addressed. If you ask him Gordon Frickers denies being a ‘perfectionist’, he says that is a misunderstanding. He would add “I am aware most people would not consciously notice am extra effort but they do notice intuitively. 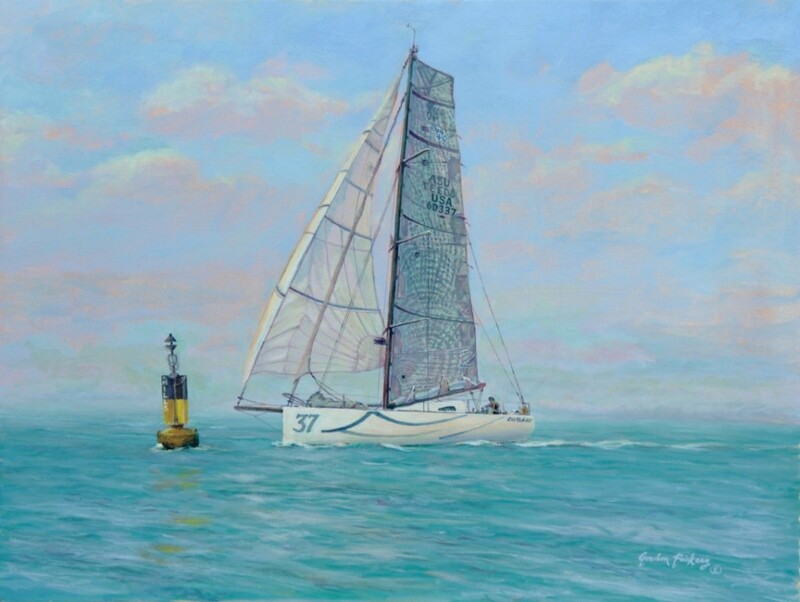 As with the very small refinements one makes on a fast boat the extra effort has to come out some were, on a boat it manifests as a tiny % more boat speed, in a painting as more ‘feel’, superior ‘quality’. To the detriment of my family and self, I’ve not been very concerned about making money. My attention has been on ‘how can I do that better’”. 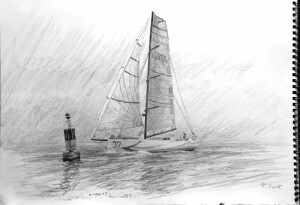 You could like to own a painting of drawing of this sort of quality, even if you have no idea what the subject will be, start your adventure now, Contact Us.